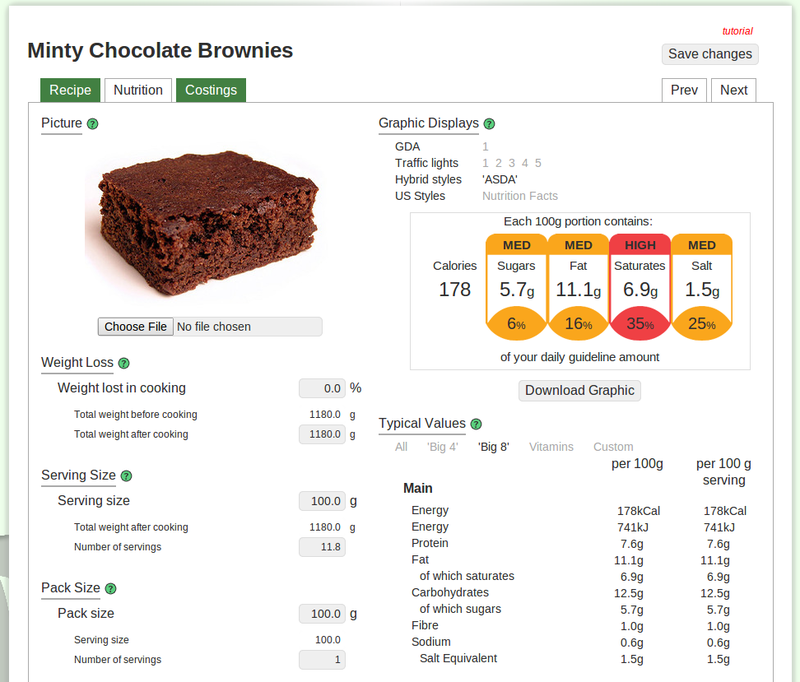 Food labelling made easy - a la calc blog: Our biggest update ever - including LIVE results updating, faster performance, new tools and image uploads! Our biggest update ever - including LIVE results updating, faster performance, new tools and image uploads! Our regular readers will know we slave away tirelessly at improving the performance and productivity of a la calc. The last couple months have been no exception. It has been a while since our last lot of updates in March earlier this year, but it has been worth it! For more details keep reading. It has been requested that we allow downloads of multiple recipes' information at once. To enable this we've reworked the layout of information in the My Recipes overview to allow you to select multiple recipes and download a single PDF containing all of those recipes' results (instead of opening each recipe individually to download the PDFs). To select a recipe simply check the checkbox by the recipe on which you wish to perform an action. Clicking the checkbox at the top of the list selects/deselects all recipes. This new layout paves the way mass applications of actions, for example, in the coming months we intend to allow applying labels to recipes and the new checkboxes system will mean you can apply a label to many or all recipes with a few clicks. Stay tuned to this area of a la calc for more development. To access the My Recipes overview click My Recipes from the very top navigation bar and then click view all. We've been thinking for a while that the old Basics and Ingredients tab slowed down the process of creating a recipe, needing you to first set a name and parameters before having to save and load a different page to start adding ingredients. To remedy this we've built combined the content of both tabs to a single tab where you can define their recipe all in one place. By clicking on Create New from the Workspaces or My Recipes menu you can immediately start entering ingredients to their recipe, add notes and name the recipe without having to load a second page. Simples. You may notice that from the Recipe tab we've removed the option to set a recipe as a sub-recipe. This is because from now on all recipes will be available as sub-recipes as standard. This removes the need for you to go back to old recipes to mark them up if you forgot to previously. This tab is an area I'm personally very excited about. 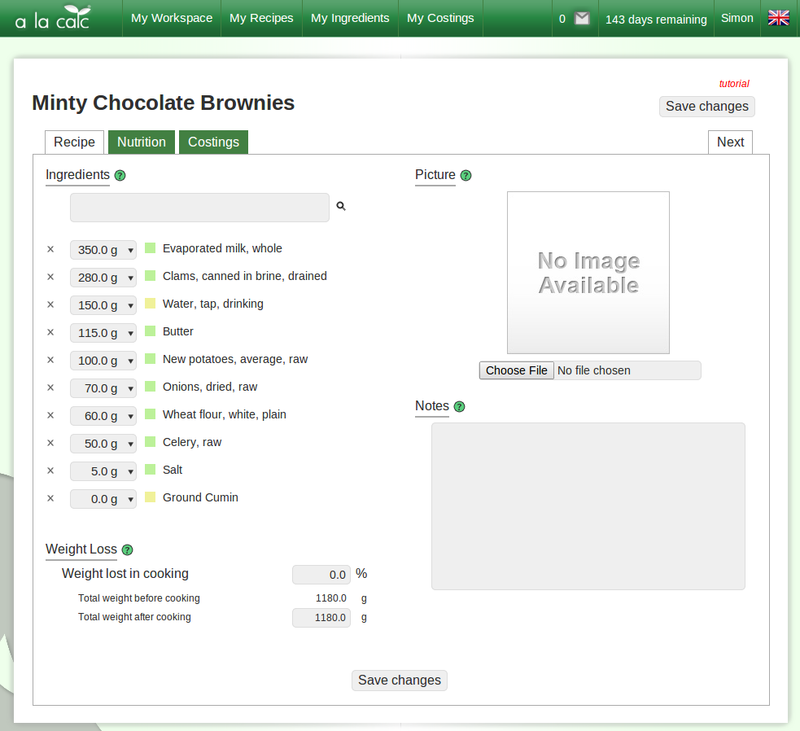 The Nutrition tab shows you all of your recipe's results and graphics and allows you to tweak certain aspects of your recipe. At first glance you may think that not much has changed here, but we have made many subtle changes to the way the page loads and is built. We've rebuilt the framework for the way the page is handled meaning the page loads much faster and is more scalable in the future. We've added a few extra tweaks to aid your work such a serving size calculator and pack size calculator. As well as highlighting ingredients that contain allergens in bold as is required in a recent update in pack labelling regulation in the UK. Sub-recipes now have their ingredients listed in the ingredients list as a smaller inset list. To access this click the marker next to a sub-recipe and the contained ingredients will slide into view. The UK and the US graphics now all appear on the same page without needing to change the flag switcher in the top corner. Finally the most exciting new feature here is the live updating of graphics and typical values. When you edit a value in any of the serving size, pack size or weight loss fields, the values in the graphics, the traffic light colours and the typical values table all instantly update to reflect the new value. This makes optimising the recipe incredibly simple, quick and even fun. Just remember to hit Save changes when you're happy with the results! 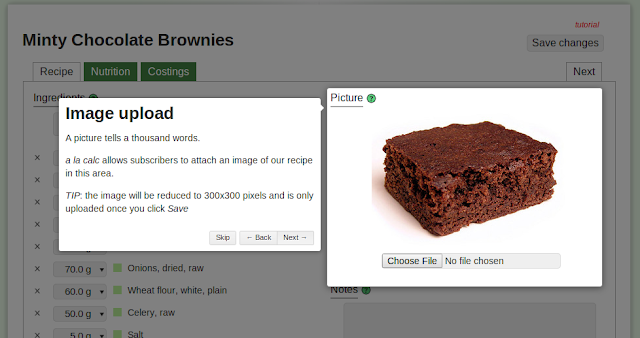 One suggestion we've had periodically from our launch is the request for being able to attach an image to your recipes. Now you can. Subscription users can upload an image for each of their recipes. Our test subjects found it particularly useful in conjunction with the notes for giving cooking instructions and an example of how the finished product should look. Others have found it useful for quickly identifying recipes with similar names. 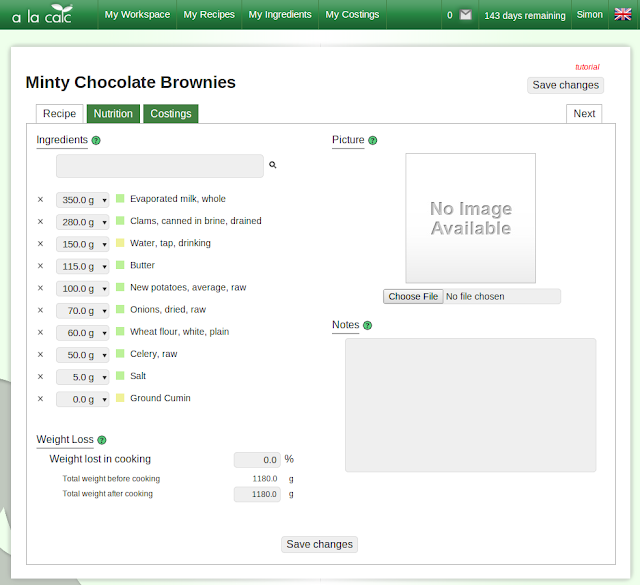 Images can be uploaded from the Recipe tab or the Nutrition tab. We are often asked about the availability of training sessions or courses for a la calc, but we find that the organisation of such courses the restrictions because of locality and the cost to everyone is off putting. So we've worked hard at creating in page step-by-step guides to using a la calc. The tutorials are only available in the recipe tabs for the time being but we plan on pushing them out through the entire website in the coming months. Phew! For now, that is it. All these changes are available NOW, just sign in to enjoy. In case you're wondering why we've left out the new UK graphic standard from this update, that will be along in the next update in the next few weeks as it still requires a little more testing.